Hospital Train No. 41 loading patients, near Riardo for its run to Naples, Italy. Picture taken in February 1944. Evacuation of wounded and injured personnel should be efficient and organized! Beginning with the moment that a man is wounded at the front, there must be a continuity in his handling and treatment until he is again fit for release from control of the Medical Department. There is a constant sorting of all casualties at the front with a view to determine which are to be evacuated and how. All patients who can perform duty and are not a menace to the health of the command are to be returned to their organization as promptly as possible! 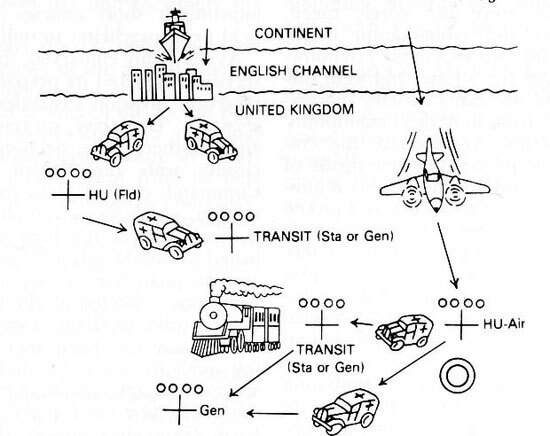 No cases are sent farther to the rear than the military situation and their own condition demand; cases which can be treated successfully within a command are not evacuated, unless it is necessary to relieve the command of their care in order to free it for movement or to make room for new cases. Serious medical cases are transported the shortest possible distance consistent with military operations and their proper treatment. Cases requiring prolonged treatment are sent to the Communications Zone and from thereon, to the Zone of Interior. The means of transporting sick and wounded from Evacuation Hospitals in the combat zone to another Hospital in the Communications Zone consists of Hospital Trains, Hospital Ships, and occasionally, Motor Convoys and Airplane Ambulances. The usual method of transporting patients from the Evacuation Hospitals in the combat zone to General Hospitals in the Communications Zone was by means of Hospital Trains. For moving patients (as for moving troops), all suitable means of transportation were used in wartime! Railways, sea and air transport, motor ambulances, and equipment, whether standard or improvised, were introduced. It wasn’t the first time, the United States Armed Forces had considered moving patients by rail. It had happened during the Civil War, during the Great War, and it took place in World War 2 as well. During the War, the Army found it advisable to build a fleet of specially constructed Hospital Cars to handle the rapidly growing traffic of personnel and equipment (expansion of the Armed Forces, and increased involvement in overseas operations), and the most serious medical cases. Of course, the railroads’ regular services and equipment were still required for transportation of civilians and military. Movements of patients being transported to or between medical facilities in the Zone of Interior, were regulated by The Surgeon General, who had to take into account the medical needs of the patients and bed vacancies in the respective Hospitals. The Surgeon General supervised the maintenance of the medical equipment and the staffing of the cars with medical personnel. Movements from the water ports and aerial ports where patients landed after evacuation from Overseas Theaters, were regulated by The Chief of Transportation in close collaboration with The Surgeon General. Coordination was provided by the Hospitalization & Evacuation Branch, ASF Headquarters. The different Service Commands were responsible for staffing, supplying, and cleaning the cars. At the beginning of 1939 the Medical Department had NO Hospital Trains on hand and only indefinite plans for procuring them in the event of war! 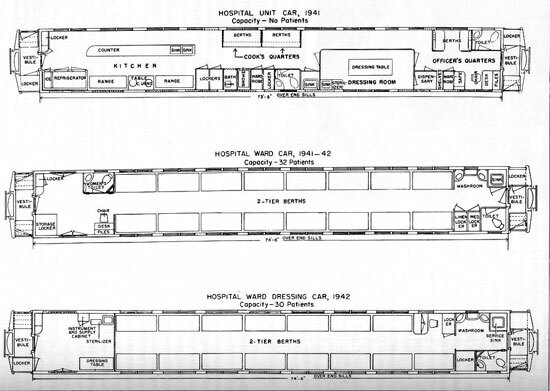 Although without definite plans, the US Army would acquire 320 Hospital Cars for operation in the Zone of Interior – of these, 120 were former Pullman sleepers and lounge cars that would be converted to Hospital Cars with 32 berths arranged in 2 tiers – the remaining 200 would be specially designed and built as Hospital Cars with accommodations for 36 patients in 3-tier berths. In the fall of 1940, The Surgeon General requested to convert 2 Pullman cars into Unit Cars, furthermore additional railway equipment and 20-ton cars were ordered by the Corps of Engineers to test some of these for possible use in Hospital Trains. In February 1941, it was discovered that Pullman cars had washrooms at either end, and therefore patients on litters could not be carried from sleepers to Unit Car operating rooms! In spring of 1941, Pullman prepared conversion plans for modifying std. Pullman cars into Ward Cars … additional plans in September 1941 called for a Hospital Train to consist of 1 Government-owned Unit Car, 2 Government-owned Ward Cars, 1 Baggage Car, and a variable number of std. Pullman or Chair Cars. 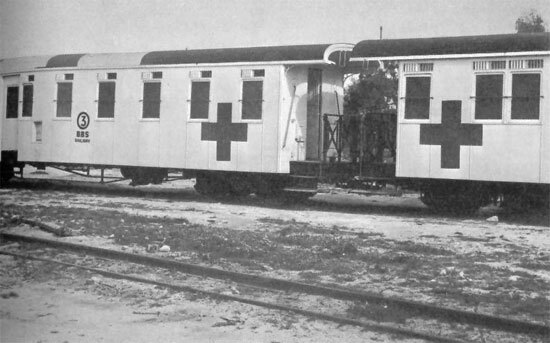 By December 1, 1941, the Army had 2 Unit Cars and 4 Ward Cars, enough to serve as a basis for two Hospital Trains (however no air-conditioning was installed). Early in January 1942, additional Hospital Cars were requested with the necessary changes. 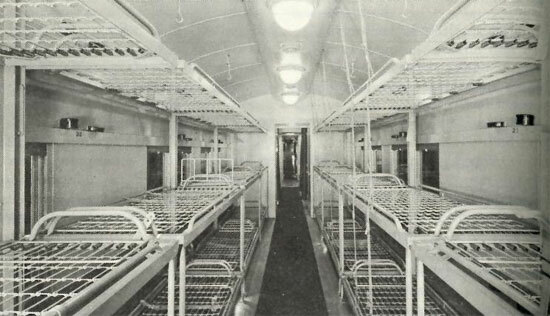 The Surgeon General’s Office and the Pullman Company developed a Ward Dressing Car, which moreover contained a small dressing room, necessary space for 30 litter patients, but no kitchen facilities (since food was to come from commercial dining cars). 6 Ward Dressing Cars + 12 Ward Cars were ordered in March 1942, and subsequently delivered to the Charleston – New Orleans – San Francisco and New York Ports in July and August of 1942. On April 1, 1942, the Medical Department issued T/O 8-520 which provided for a self-sustained unit to operate a complete Hospital Train of max. 360 patients. For administrative, mess, supply functions and medical care, each unit was authorized 4 Medical Officers + 6 Nurses + 33 Enlisted Men (8 such units were organized between June 1942 – June 1943, and destined for overseas Theaters of Operations). While such medical personnel were normally assigned to Station or General Hospitals (until mid-1943), they were later replaced by separate Train units indorsed by the different Service Commands, which were granted additional personnel from ASF Headquarters. Air-conditioning was requested in June 1942 and tested in September of the same year, before implementation took place. In October and November of 1942, there was disagreement about the type and number of Hospital Cars, and also about procurement of same. Finally, a global decision was reached on November 24, 1942 whereby SOS Headquarters directed the Transportation Corps to procure at least 40, and if practical, as many as 96 Ward and Ward Dressing Cars (contracts signed Jan 43). Requirements for the Zone of Interior would differ: directions in December of 1942 called for 2 Doctors, 1 Nurse and 14 Enlisted Men per 100 patients – 2 Doctors, 1 Nurse, 16 EM for 200 patients – 3 Doctors, 1 Nurse, 19 EM for 300 patients, and 3 Doctors, 1 Nurse and 21 EM for 400 patients. Moderate increases in personnel were to take place, as well as numbers of patients to be evacuated. Procurement between 1940 – 1945 consisted of 380 (Hospital) Cars, of which 2 Unit Cars (delivered Feb 41), 4 Ward Cars (delivered Nov-Dec 41), 6 Ward Dressing Cars (delivered Jul-Aug 42), 12 Ward Cars (delivered Jul-Aug 42), 32 Ward Cars (delivered Sep-Dec 43), 64 Ward Cars (delivered Sep-Dec 43), 40 Kitchen Cars (delivered Mar-Sep 44), 100 New Unit Cars (delivered Nov 44-May 45), 100 New Unit Cars (delivered May-Aug 45), and 20 Kitchen Cars (delivered Mar-Jul 45) – note : all Hospital Cars were declared surplus between Nov 45-Jun 46). In the course of discussions taking place about the numbers and types of Hospital Trains needed for the Zone of Interior, the question of such Trains for Theaters of Operations naturally came up too! Before mid-1942, the Engineers had switched from 20-ton to 40-ton Cars as the std. for overseas military trains! These were accepted, after a thorough study of blueprints by the Surgeon General. Specifications were subsequently drafted for combat-zone Hospital Trains of 21 40-ton Cars by the end of November 1942. Meanwhile, in late 1942 and during the first half of 1943, types and numbers of Hospital Cars needed were still being discussed, resulting in quite a list of additional changes – further modifications were again carried out late 1943 and early 1944. In July of 1943, it was also decided to procure Kitchen Cars and a first unit was received for testing in December 1943. In October 1943, The Surgeon General’s Office requested the Transportation Corps to provide 50 New Type Unit Cars, to be delivered by May 1944. However, no new development was to be started, as the request was rejected by ASF, resulting into a complete reappraisal of the Hospital Train Program! On April 11, 1944 it was agreed to construct 100 New Hospital Cars. Developing the new Unit Car and modifying existing Ward and Ward Dressing Cars resulted in gradually making up Hospital Trains for a number of destinations and with a variable number of Hospital Cars in different combinations. Hospital Kitchens were now always attached to the Train, as long as a number of Hospital Cars remained with the Train. Hospital Cars in use during (late) WW2 in fact possessed an adaptability which permitted them to be used along with other Cars to make up a complete Hospital Train or singly transport small groups of patients on commercial trains, resulting in quite an advantage ! Hospital Trains evacuated patients from Evacuation to General Hospitals, between General Hospitals, and from General Hospitals to ZI Ports. Hospital Trains were in fact true Medical Department organizations. Their distribution and use was controlled by the MD, and as such, personnel, supply and maintenance of the medical equipment, was administered under the direction of the Chief Surgeon of the field force, except those assigned for evacuation within the Communications Zone, which operated under Theater control, under direction of a Regulating Officer. As railway units, the trains were operated and maintained mechanically by the Corps of Engineers. The number of Hospital Trains required depended on the type and severity of combat and the location of the Theater of Operations. 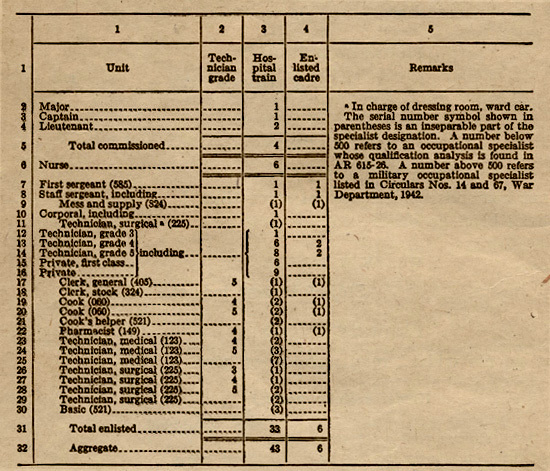 Chart of T/O 8-520, dated April 1, 1942 illustrating manpower figures for a Hospital Train. Each of the Ward Cars was sufficiently equipped with pajamas, sheets, pillows, blankets, compartmented trays, bed pans, litters, medicine cabinets, catheters, and a complete Ward Case containing hemostats, scalpels and other medical instruments. The Pharmacy was supplied with prescription balance, graduates, drugs and medicine. According to T/O 8-520 dated April 1, 1942 personnel of a Hospital Train consisted of 4 Officers, 6 Nurses, and 33 Enlisted, subdivided as follows; 1 Major – 1 Captain – 2 Lieutenants – 6 Nurses – 1 First Sergeant – 1 Staff Sergeant – 1 Corporal – 1 Technician 3d Grade – 6 Technicians 4th Grade – 8 Technicians 5th Grade – 6 Privates First Class – and 9 Privates. Hospital Trains were equally organized in Britain. Upon request from the United States Army, the British Ministry of War Transport assembled from its own rolling stock a total of 39 (Hospital) Trains for American use in Britain (and eventually across the Channel, after the D-Day operation). While the medical equipment came partly from British and partly from American stocks, the Hospital Trains were entirely staffed by US medical personnel. The Trains included kitchen, surgery, pharmacy, and staff accommodation cars, as well as 36-litter ward cars, coaches for ambulatory patients, and diesel heating and power plants. By the end of 1943, routing of patients to the General Hospitals, where they could stay until recovery or further evacuation from the Theaters was effected by using the first 15 (out of the 39) British-built and –operated, and US Army-staffed Hospital Trains all based in southwest England. Transit Hospitals used their own ambulances and trucks (as well as vehicles borrowed from other units), to bring prescribed loads of patients to their assigned railheads. Hospital Trains in operation in North Africa: (trains basically assembled from French rolling stock), 42d Hospital Train (Mar 43), 41st Hospital Train (May 43), 66th Hospital Train (Jun 43). 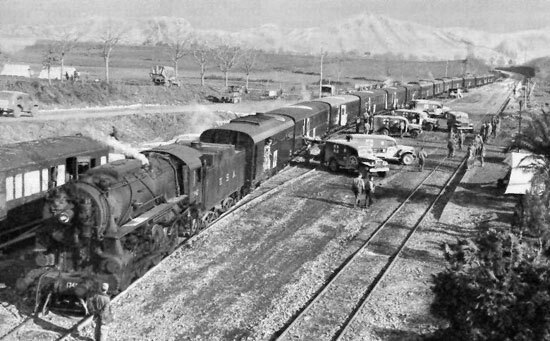 Hospital Trains in operation in Italy: again the already existing 41st Hospital Train (Nov 43) and the 66th Hospital Train (Jul 43). Introduction of Hospital Trains on the Continent. 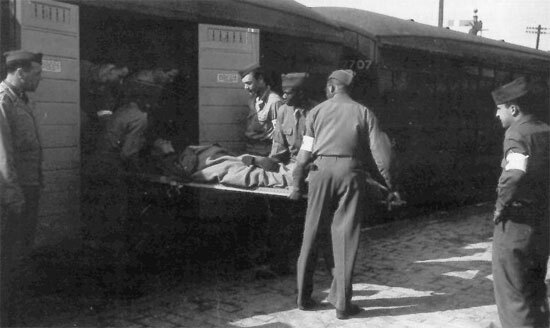 After Operation “Neptune”, Hospital Trains were at first improvised from captured rolling stock (both German and French), while those trains constructed in England were expected to begin rolling off ships at liberated French ports and beaches. But ferrying of the British-built overseas Hospital Trains was late because of the delayed opening of the Cherbourg docks. 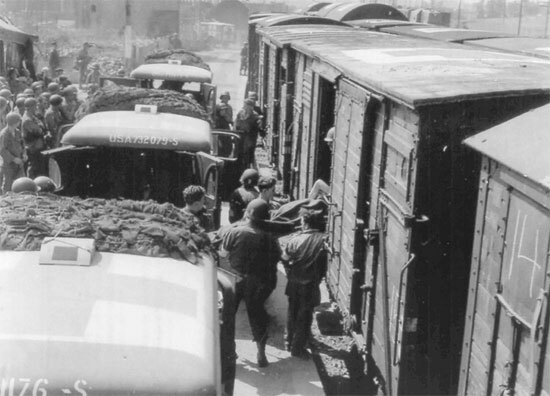 Fortunately, by the end of July the Transportation Corps had restored most of the Cotentin rail network, and on August 4, 1944, the first locally improvised Ambulance Train (French freight cars fitted with litter brackets, and other improvisations) was put into service between St. Lô and Cherbourg, staffed by the 11th Hospital Train personnel. The very first Hospital Train from Britain only reached the Continent on August 14, it was the 43d Hospital Train. Engineer units succeeded in opening a circuitious route into Paris on August 30 and even had portions of the much more extensive but less damaged network (north and east of Paris) usable, stretching as far as Liège, Verdun, and Toul by late September. Hospital Trains now running up to Paris carried casualties back to Cherbourg, and medical units, usually General Hospitals, forward. By October 1944, there were 25 Hospital Trains running on the continent. ComZ would further increase its medical rolling stock, by bringing over additional Hospital Trains from Britain, building some on the continent by the French Railways, and shipping 4 new Trains directly from the United States, thereby reaching 34 Hospital Trains by end of 1944. 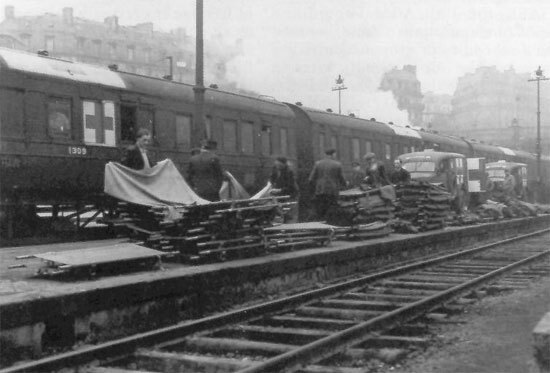 There was now an aggregate capacity of over 8,000 litter and 3,700 ambulatory patients, exceeding the ETO’s requirements; moreover the equipment was adequate for the task, and movement was improved in such a way that an average trip between Paris and Cherbourg now only took about 47 hours (compared to 96, and 120 earlier in the Normandy and N. France campaigns). 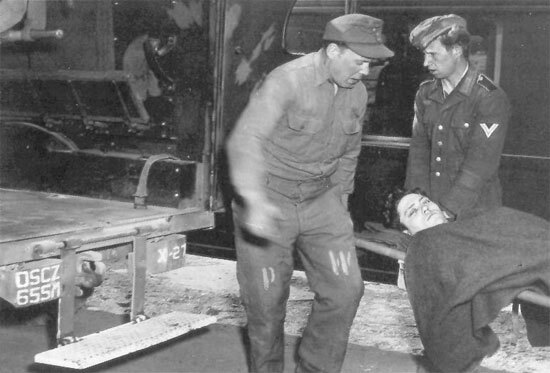 The 40 Hospital Trains became ‘overworked’ during and after the German counteroffensive in the Belgian Ardennes (Battle of the Bulge) working at full capacity, day after day, and week after week. More trains had to be organized (French-built and imported American units) and staffed with provisional detachments assembled from General Hospitals personnel. For further information regarding E.T.O. Hospital Trains, please view the artice found here.